For heading this chapter as above there are several sound reasons. First, to differentiate the subjects of the chapter from the rotary-engined single-seat Triplane just described (which, for sheer convenience, was sometimes called the 'Clerget Triplane') and to emphasise the basic nature of that distinction. The next reason is that the physical characteristics of the two machines now scrutinised differed so greatly from those of the other Sopwith triplane types - which numbered no fewer than six quite distinct ones, the present pair being considered as a single type only, for they were essentially alike - that these characteristics alone warrant individual study. A third reason is to dispel an understandably persistent misapprehension that the Hispano-Suiza single-seaters which now concern us were close relations of the 'Clerget Triplane' - which they were not. Enlarging upon this third point to the verge of over-simplification, the rotary-engined 'Clerget Triplane' can be regarded as a Pup development, while the Hispano-Suiza pair were quite distinctly related to the 1 1/2 Strutter. Like the two aeroplanes themselves, the story of their development has a special interest-even amidst the prolific and interesting Sopwith family of types; and it would hardly be overstating the case to affirm that they represent not merely a distinct type but a distinct class. These matters being so, one must direct attention to seemingly neglected areas of study, and to note at the start that the two Sopwith ‘Hispano Triplanes' (as we may now tidily call them, though one designation used by Sopwith was seemingly 'Sopwith 200 H P. H.S. Tractor Triplane’) were numbered N509 and N510. Thus they were not only RNAS machines, but shared both a numerical sequence and a structural affinity (being triplanes) with N511-N514, which were Armstrong Whitworth quadruplanes. Further, it seems proper to remark, N503 (an apparently unbuilt Clerget-engined Pup development, already mentioned) was numerically preceded by N502 - a Blackburn triplane fighter, for the design of which Harris Booth, formerly of the Admiralty's Air Department, was responsible. Chronologically, the Hispano Triplanes followed shortly after the Clerget Triplane, and thus were flying during 1916 - before the Clerget machine was established in service. Indeed, some hiatus in respect of Hispano-Suiza engine development or delivery may well have been responsible for a delay at Sopwith; and that the basic design of the Hispano Triplane (1 1/2 Strutter-related) actually preceded that of the Clerget Triplane (Pup-related) seems not only possible but entirely comprehensible, for the Pup was preceded by the 1 1/2 Strutter. This particular reference to Hispano-Suiza engines now calls for an explanation of the plural (Triplanes) used in the present chapter-heading. In essence this is simple enough N509 had a 150 hp direct-drive engine whereas N510 had a 200 hp geared engine; but there will be more to say concerning Sopwith's new French affiliation in the engine field, the fate of which could well have been sealed at quite an early date by the pressing demands of the S.E.5 programme for to the French water-cooled vee-8, or a unit of similar form, this 'Factory' fighter project was wedded. Meanwhile attention must be redirected to the two new Sopwith airframes. 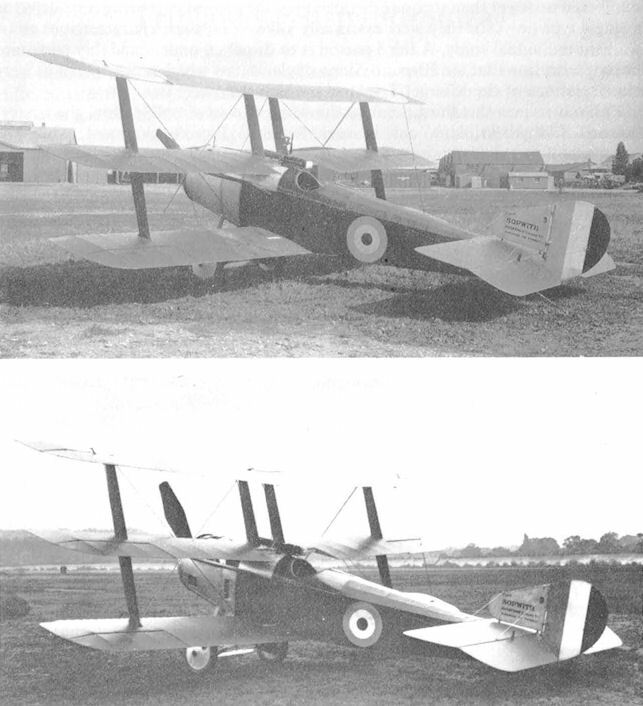 The main components of the tail unit were seemingly identical with those of the 1 1/2 Strutter, and the fuselage being deep, the cockpit coaming was similarly deep - far more so than on the Clerget Triplane and located further aft in relation to the wings. (The pilot's field of view was thus accounted poor). It is the wings themselves that have doubtless been responsible for over-close associations between the Hispano and the Clerget Triplanes; for though visually similar, especially by reason of the 'plank' interplane struts, those of the Hispano machines measured roughly 2 ft more in span and - perhaps more significantly - about 1 ft more in chord. Precise dimensions are lacking, but as the chord of the Clerget Triplane was a mere 3 ft 3 in, the difference is, as suggested, truly significant. Especially true is this because a Clerget machine was tested (as noted in the foregoing chapter) with wings increased in chord by 3 in only. Though performance figures, like other data, are scanty and possibly suspect, the rate of climb - only 9 min to 10.000 ft - ascribed to one of the two Hispano Triplanes is remarkable. One especially interesting aspect is that the time represents only about twice the corresponding figure for the R A F's Hawker Fury intercepter of the early 1930s. (The Armstrong Whitworth Siskin III, first issued to the RAF in 1924, reached 10,000 ft in about 8 1/2 min). One factor which might conceivably have contributed to the Hispano Triplane's rate of climb would be a carefully chosen' wing section, though its pattern is not known. While rigging was similar in principle to that illustrated in the preceding chapter, wing construction must have differed quite considerably, by reason of the greater chord; and though the best available photographs do not confirm that 'the middle wing was on top of the fuselage' as Harald Penrose has it, this may well have been so in one particular form. To this very feature, in fact, Mr Penrose has ascribed a 'decreasing wedge for the air flow, resulting in turbulence which caused the tailplane to break off the more powerful second prototype N.510." The catastrophe just mentioned occurred during trials at Eastchurch in December 1916 - in which connection it may be remarked that, obscure though N509 and N510 remain in history, they were evidently quite familiar sights not only at Brooklands but at several RNAS establishments also. 'Tail vibrations' were noted on N509 by Harry Busteed when he flew it on 2 January, 1917 (very shortly after the crash of N510), but in the following March this same machine was at Westgate, near Manston, Kent, and it was finally written off (in the clerical sense at least) at Manston on 29 October, 1917. The installation of the Hispano-Suiza engine in each of the two triplanes calls for special comment, for the greatest pains had clearly been taken to fit Marc Birkigt's masterly creation of 1915 to the best advantage. In each case the frontal radiator was circular in form, but though the cowling generally was neat, the tops of the cylinder-banks were prominently visible, and unfaired either at front or rear. This feature doubtless stemmed from the 90-degree setting of the cylinder-banks themselves, though for 'banks' the term 'blocks' might justifiably be substituted, for the Hispano-Suiza engines were the first in which screwed steel liners were used in conjunction with 'monobloc' cast-aluminium jackets and heads. 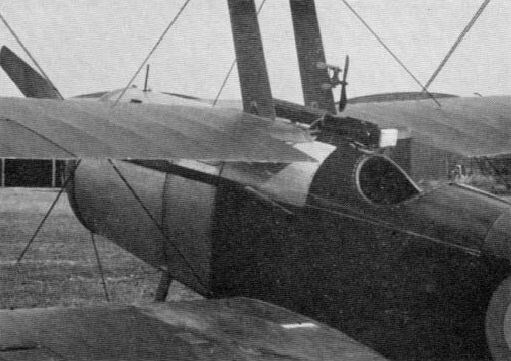 Tail-pipes, terminating (somewhat curiously, it may be supposed) just forward of the cockpit were fitted to the exhaust manifolds, though the ends of the pipes were toed-out from the fuselage. On the engine of N510 the reduction gearing accounted for a slightly higher thrust-line and a left-hand propeller. In one form at least N510 had a revised fuel system, with a gravity tank in the top centre section and fuel pipes running down the central interplane struts the starboard one of which (on both machines) carried a wind-driven pump, as on the Clerget Triplane. Cowling details varied considerably, though a large air-exit louvre just aft of the front landing-gear strut on the port side was seemingly characteristic of N510. To these foregoing remarks one would now add a further reflection: Although a 400-round drum for the Lewis gun was still being considered as a possible provision for fighters in the early 1930s, a drum of this capacity had in fact been designed by early 1917. While recognising that a Lewis gun with a monstrously tall drum holding 400 rounds of S.A.A. might prove too weighty and too drag-producing an item for a (relatively) light and low-powered single-seat triplane to carry in each of its bottom wings, one recognises equally that the Hispano-Suiza engine was sometimes adapted to carry a Lewis gun instead of the more famous Puteaux canon. An early S.E.5 scheme had, in fact, involved just such a combination, though not, apparently, with an oversize drum-magazine for the Lewis gun. The Sopwith Hispano Triplane, with its excellent lifting capacity, might well have been adapted for - indeed, intended for - an 'engine gun' combination. Equally (and there is some slight evidence to suggest that positive steps were taken in this direction) the type might have carried a bomb or bombs, though unlike the single-seat 1 1/2 Strutter bomber and the larger and later B.1 - externally, and not in the fuselage behind the pilot. (150 hp direct-drive or 200 hp geared Hispano-Suiza) Span 28 ft 6 in (8.7 m); length 23 ft 2 in (7 m). Maximum speed 120 mph (193 km/h); climb to 10,000 ft (3,050 m) 9 min. Triplane (Hispano-Suiza). Yet another Sopwith fighter dating from 1916, this type differed radically from the earlier rotary-engined machine. Two examples were built, one with 150-hp, the other with 200-hp engine. Both had a single Vickers gun, mounted much as on the earlier type and having Sopwith Kauper synchronising gear. The end of the gun was padded and there was a small metal screen forward of the feed block. As on the earlier Triplane, there were drag and anti-drag wires attached to the spars of the lower wing, but on the Hispano-Suiza machines there were two access panels outboard of each of the ribs to which these wires were attached. These panels somewhat resembled those on the later Sopwith triplane fighter, the Snark, and with which auxiliary outboard armament was associated. Definite conclusions, however, would not be warranted, especially so as the panels were at the anchorage points for the lower drag wires. 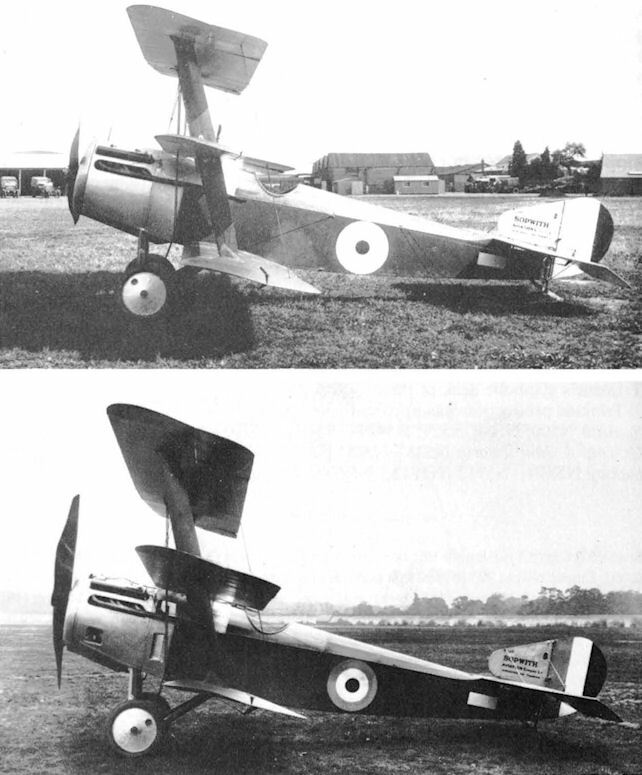 Although Sopwith’s Hispano-Suiza-engined triplane fighter was almost contemporary with the Clerget-engined Triplane, it was a completely different aeroplane, common design features being confined to the wing configuration and the style of interplane struts. Designed around the new Hispano-Suiza eight-cylinder water-cooled engine, two prototypes were completed, one with the 150 hp direct-drive version of the engine and the other with a 200 hp geared version. The Hispano-Suiza Triplane featured a circular nose radiator and was generally larger than the Clerget-engined aircraft, all mainplane dimensions being greater and the fuselage apparently owing more to that of the 1 1/2-Strutter than to the Pup. Armament was again one synchronised 0.303-in (7,7-mm) machine gun. Engine availability delayed the completion of the two prototypes until the late autumn of 1916. 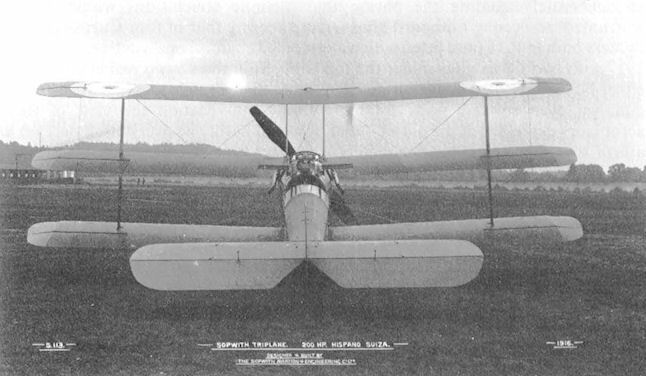 The 200 hp second prototype was lost on 20 October 1916 as the result of a flutter-induced tail failure, and the 150 hp first prototype continued flying until the autumn of 1917, during which it flew several home defence sorties from Manston. No further development was undertaken. The following data relate to the second prototype. Time to 10,000 ft (3 050 m), 9.0 min. Span, 28 ft 6 in (8,69 m). Length, 23 ft 2 in (7,06 m). Wing area, 340 sq ft (31,59 m2).